The Sharks’ dream Game 7 was, necessarily, a nightmare for Nashville. Or: You don’t lose an elimination game 5-0, getting outshot 17-3 in the first and only managing 20 shots on goal of your own all night, without just about everything going wrong. It was a true team effort, but the most visible Preds failures came at the back end, with all-star pairing Shea Weber and Roman Josi on the ice for all five San Jose goals, and Pekka Rinne understandably throwing a tantrum before being pulled in the third. Rinne had a night to forget, but he certainly hadn’t been done any favors by the usually dependable pairing in front of him. On the Sharks’ first goal, on the man-advantage (they were 8 of 21 on the power play in the series), Weber found himself out of position. He bit on a pass to Patrick Marleau down low, realizing too late that he had committed away from a wide-open Joe Pavelski. Weber went down, Pavelski elevated, and that was that. The Sharks’ second defensive lapse was even easier to spot. Josi lunged for the puck and Joel Ward went through him like a turnstile. Weber wasn’t able to get over to help in time, and Rinne got beaten five-hole. You have to wait for the replay to see where things went wrong on the Sharks’ final goal, but it was Weber again. Understandably trying to be aggressive by pinching up for a hit in the offensive zone, Weber got tangled up and went down as the puck squirted out for a 2-on-1 the other way. 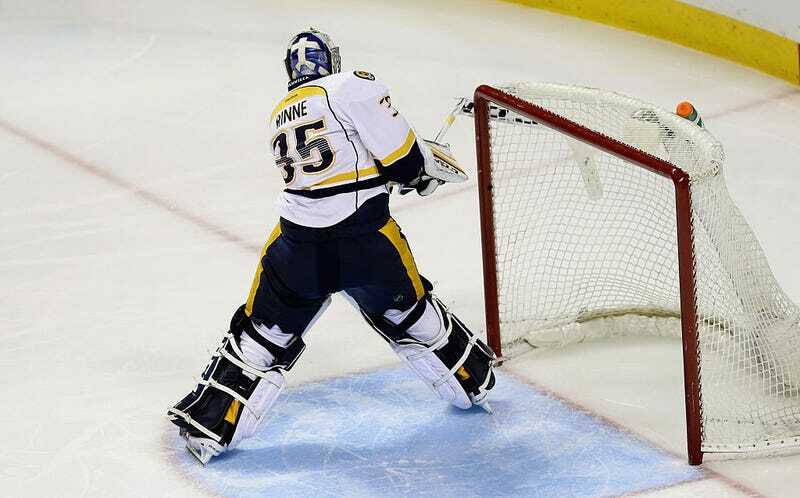 It was a bad season for Rinne, and just as rough a postseason. But there wasn’t anything he was going to be able to do last night, not with his top defenseman hanging him out to dry and his forwards barely threatening on the other end. The Predators were tired, having played more games in fewer days than anyone else, and having racked up more than double the air miles of any other playoff team. But their problems remain their usual ones, and a first conference finals appearance remains elusive. But the West has way too many snakebitten teams for everyone to get over the hump at the same time.